A pheasant on a snow-covered pine. Published by Kawaguchi Shozo, c. 1830s (seal top left). Fine impression and colour. Minimal trimming, otherwise very good condition. Signed Hiroshige hitsu. Shimadai, grouper (probably Chilodactylus zonatus) and ainame, greenling (Hexagrammus otakii) together with red-berried nanten. Poem by Kanshunro Nushibito. Probably the first edition (Kruml 18a). 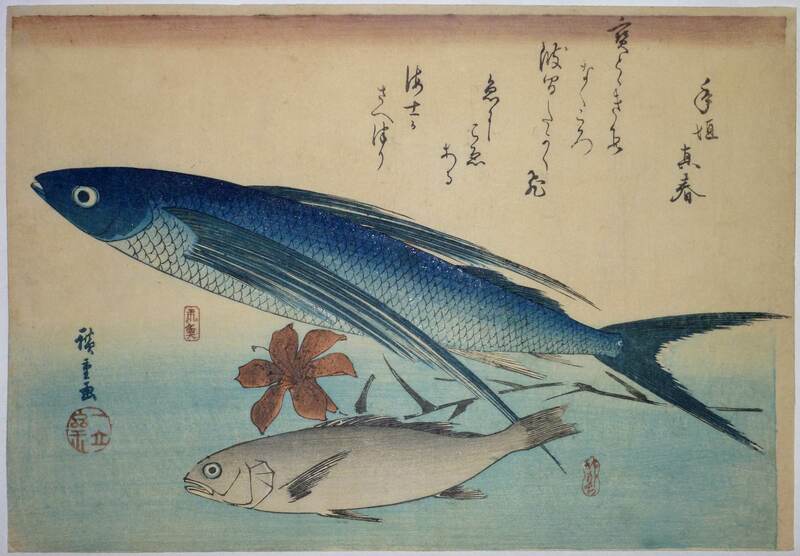 From the second series of fish published by Yamasho c. 1840-42. Fine impression, colour and condition. 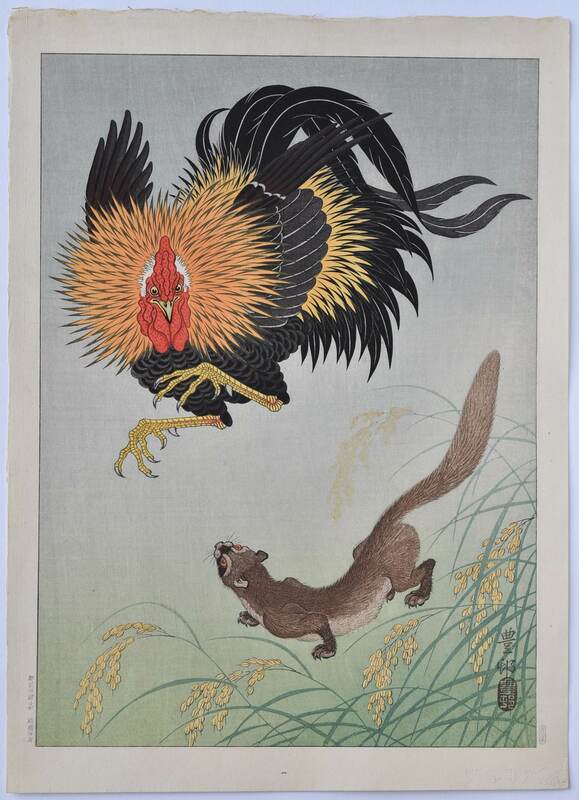 Signed Hiroshige ga.
A rooster and weasel. Published by Kawaguchi, c. 1930. The first and only edition. Ex Robert O. Muller collection. Rare. Very fine impression, colour and condition. Signed Hoson. Copyright seal in lower right margin; seal of printer, Komatsu, and carver, Maeda, in lower left margin. A tanzaku showing a rooster and hydrangea. Published by Kawaguchi Shozo, c. 1830s. Another impression is illustrated in Four Hundred Ukiyoe Woodblock Prints From The Museum Of Art, Rhode Island School Of Design, 1990, no. 121, p. 54. 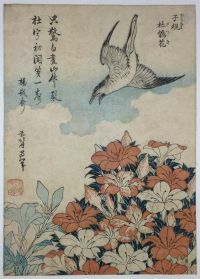 Hiroshige is best known for his landscapes, but he produced almost as many bird and flower prints. Very good impression, colour and condition. Signed Hiroshige hitsu. A bluebird and a branch of wild rose. A chuban print published c 1835-9. A very similar design with the same poem is in the Museum of Fine Arts, Boston, acquisition number 21.9729 and also a chutanzaku design, acquisition number 21.7997. Rare. Fine impression. Very good colour. Minor marks, otherwise very good condition. Signed Ichiryusai Hiroshige hitsu with Ichiryusai seal. A Java sparrow on a clematis vine. A sanchogake format (three designs printed on a horizontal sheet and intended to be separated). Published c 1835-9. 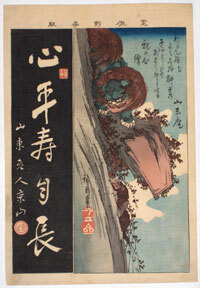 This is the first edition with the cube-shaped red Hiroshige seal. Two later impressions are in the Museum of Fine Arts, Boston, acquisition numbers 21.9590 and 65.1671. Rare. Fine impression and colour. Minor marks, otherwise very good condition. Signed Hiroshige hitsu. 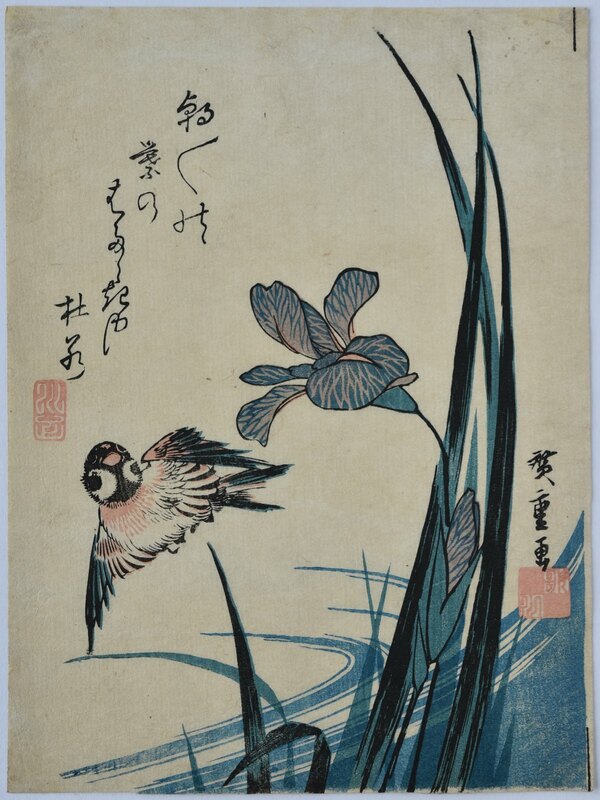 A half-block, 8.75 x 6.5 in; 22.5 x 16.5 cms, print showing a Japanese crane standing in water with a flowering plant (a variety of Berberis ?). Published c. late 1840s by Tsutaya Kichizo. Unidentified collector’s seal au verso. 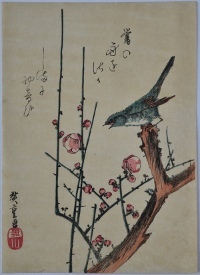 A third-of-a-block (ko-tanzaku) print, 13.5 x 3 in; 34 x 7.25 cms, showing a sparrow and cherry blossom. Published c. mid 1840s. Unidentified publisher’s seal. These narrow panels are often poorly printed, but not in this case. Very fine impression: beautiful gradation. Fine colour and condition. Signed Hiroshige hitsu. A mother monkey holding a persimmon and four playful babies. Published by Kawaguchi, c. 1930. The first and only edition. Ex Robert O. Muller collection. Rare. Very fine impression, colour and condition. Signed Hoson. Copyright seal in lower right margin; seal of printer, Komatsu, and carver, Maeda, in lower left margin. Kawaguchi catalogue number “28” on reverse. 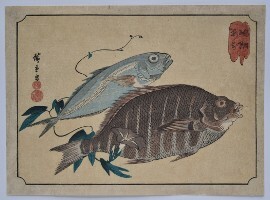 A bora, grey mullet (Mugil cephalus), together with camellia and Japanese asparagusudo. 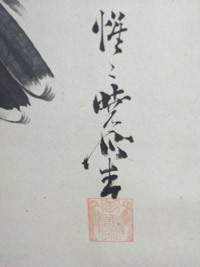 This impression is from the extremely rare first private edition for a poetry club with the judges’ names beside the kyoka poems by Higaki Kunifune and Toshinoto Haruki. 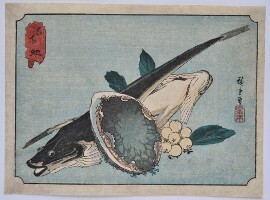 From a set of ten prints published – most likely – by Eijudo around 1832-34. 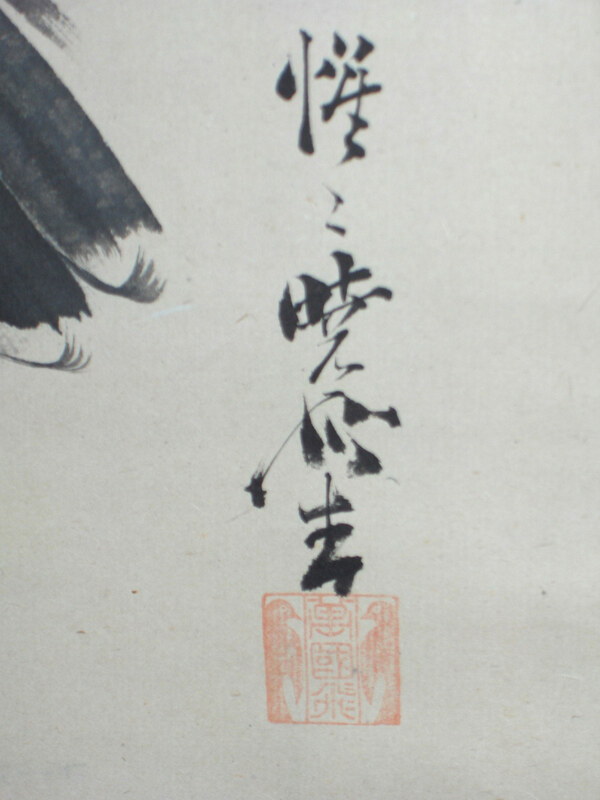 These prints were subsequently issued commercially by Eijudo with his seal and a kiwame seal (both missing here on the private printing) and with the judges’ names removed. Who the poetry group was is not known, but they must have been affluent and influential. Of the sixteen poets on the prints, four were certainly members of the Shingyoku Circle, which was affiliated to the Yomogawa. This was the group that commissioned, amongst others, Hokusai’s Horse and Shell series of surimono. There appear to be three other impressions known from the private edition: Sebastian Izzard, Hiroshige, The Ukiyo-e Society of America Inc., 1983, no. 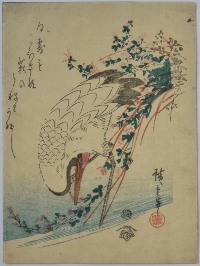 5; Ukiyo-e art, no. 18, Memeorial exhibition of Hiroshige, The Japan Ukiyo-e Society, 1968 (C) no. 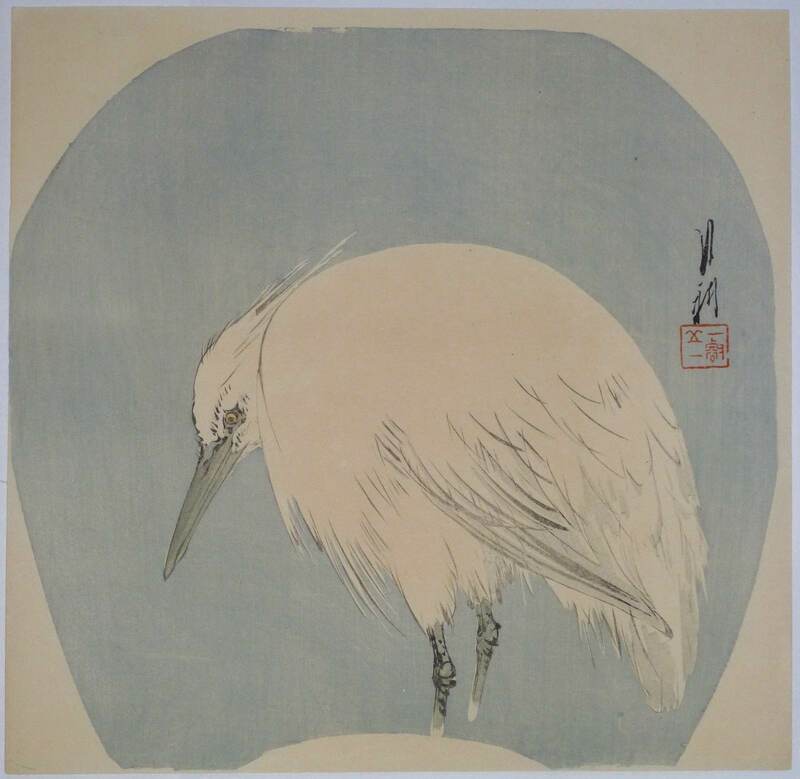 4; and Juzo Suzuki, Utagawa Hiroshige, Nihon Keizai Shinbun, 1970, no. 593. Provenance: Ex Stoclet collection. Very fine impression. Fine colour. Centre fold (as usual as they were issued in folding album form), otherwise fine condition. 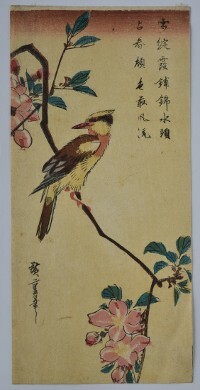 Signed Ichiryusai Hiroshige ga.
A one third block (10 x 4.75 in; 25.3 x 12.1 cms) panel showing an oriole – probably a black-naped oriole – on a branch of a flowering apple tree. Published c. early 1830s. Good impression. Very good colour and condition. Signed Hiroshige hitsu. An extremely rare aiban print showing two kochi , bartail flatheads, (Platycephalus indicus) and an abalone, sea-ear, (Haliotus tuberculate). From a set of eight prints of various fish published c. late 1830s. Another impression is illustrated in Japanese Prints IV – Hiroshige and the Utagawa School, Rijksmuseum Amsterdam, 1984, no. 45, p. 35. 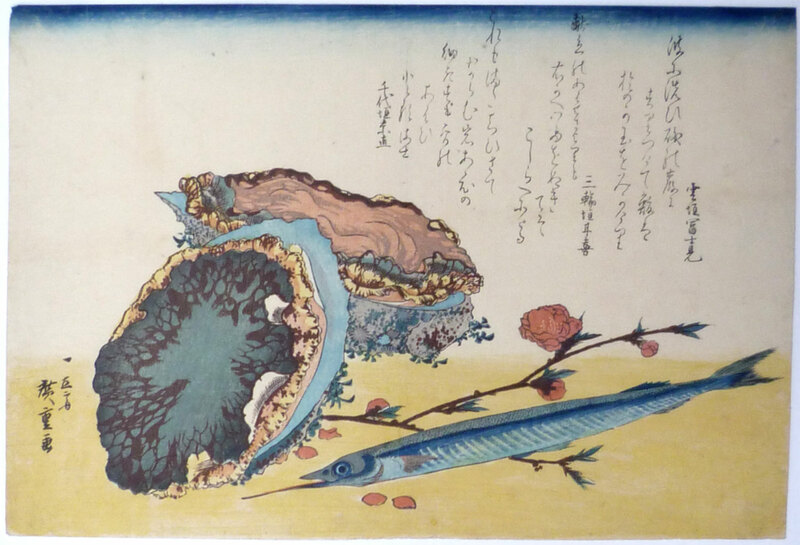 Kami, crab (Charybois) and saba, mackerel (Scomber Japonicus) together with two flowers of morning glory. Poem by Shichichintei. This is the first edition (Kruml 19a). 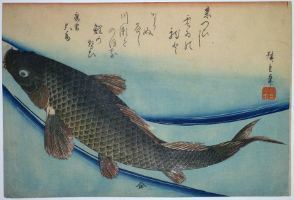 From the second series of fish published by Yamasho c. 1840-42. Unidentified collector’s seal bottom right corner. A shishi cub being taught to scale a vertical cliff. ( Shishi: ‘Chinese Lion’ [ Ch. : Shi-tzu ]. ) it was said that the shishi cast its young from a high rock to test whether it could scale the rock face in which case it became the perfect beast. Published by Sanoki, c 1839-40. Extremely rare: one other impression illustrated in The Art of Hiroshige, Tsuneo Tamba, no.410. Fine impression and colour. Small areas of expert restoration. 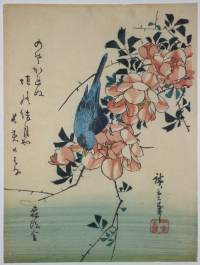 Signed Hiroshige ga.
A tanzaku showing a Japanese finch sitting on a camellia branch. Unidentified collector’s seal au verso. Very fine impression. Fine colour and condition. Signed Hiroshige hitsu. Ai or ayu, river trout, Plecoglossus altivelis. Poem by Haruzono Shizuo. From the first set of fish prints published by Eijudo, c 1832-4. This first series was issued privately for a poetry group ( probably the Shingyoku Circle ) with judges’ names and extra poems. These prints are of the utmost rarity as probably only enough for the Circle were printed and they never come onto the market. Due to their popularity this first series was published commercially and a second set was commissioned. The most sought after print in the series and probably the first to be designed. Very good impression, colour and condition. Full size with with no centre fold. Signed Hiroshige hitsu. 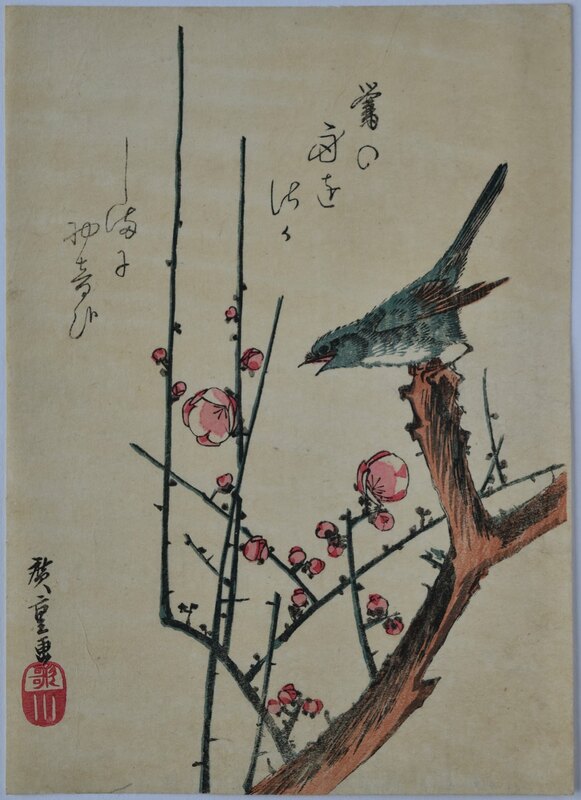 A half- block print showing a small bird (possibly a bush warbler) and plum blossom. . Published by Kawasho (Kawaguchi Shozo) c. mid 1830s. Half-blocks were printed two-to-a-sheet and divided, either vertically or horizontally. Very good impression, colour and condition. Signed Hiroshige ga with Utagawa seal. 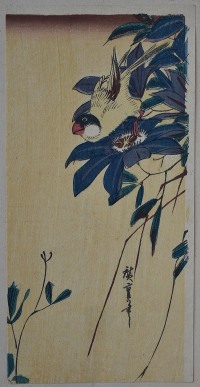 A half-block print showing a sparrow and iris. Published by Kawasho (Kawaguchi Shozo) c. mid 1830s. Half-blocks were printed two-to-a-sheet and divided, either vertically or horizontally. A chu-tanzaku showing a house swallow above a trailing yellow plant. Fine impression. Very good colour. Slight browning, otherwise very good condition. Signed Hiroshige fude. A Java sparrow on a clematis vine. A sanchogake format (three designs printed on a horizontal sheet and intended to be separated). Published c 1835-9. Rare. A fine painting, sumi on paper, showing three crows on the boughs of a willow tree. 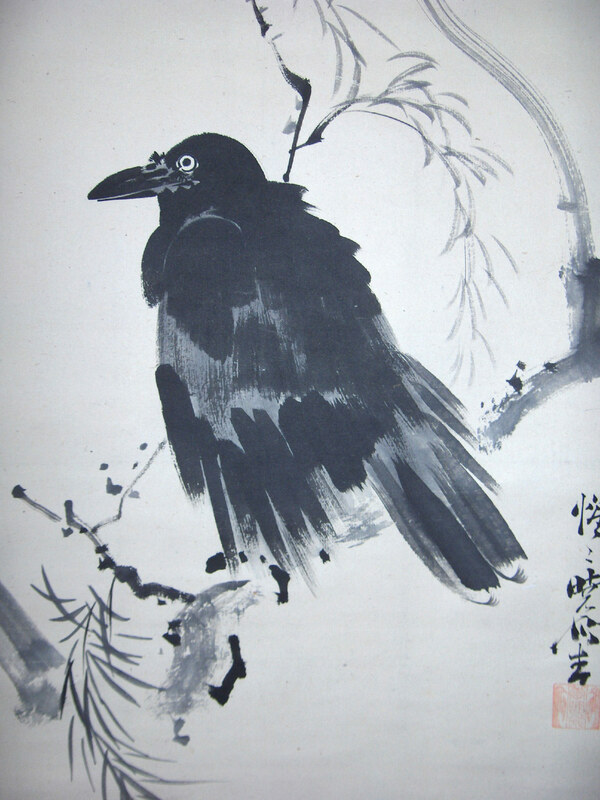 Crows were one of Kyosai’s favourite subjects and, apart from paintings, he used them in various formats: fan prints, oban and dai-oban prints. There are also numerous copies of his crow paintings. 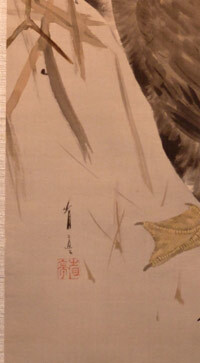 Signed Kyosai ga. 51 x 18.5 inches, 129.5 x 47 cms. Very good condition with original mount and rollers. 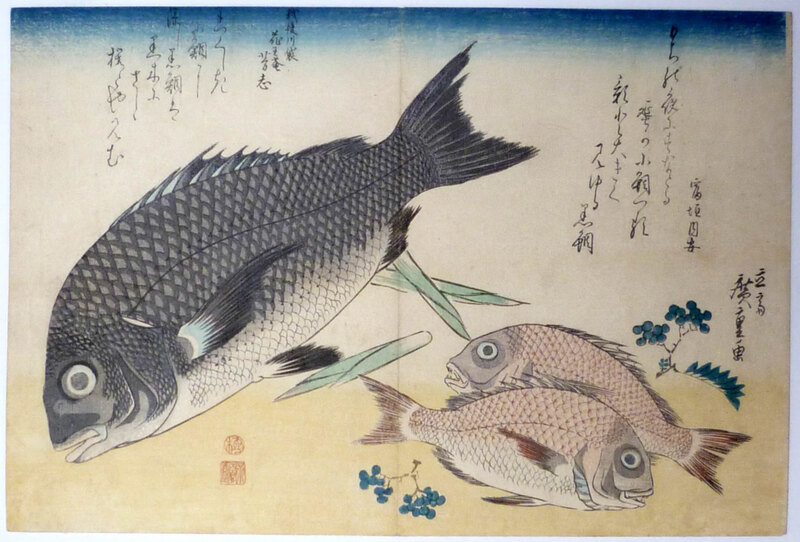 An extremely rare aiban print showing a shimadai, grouper, (probably Chilodactylus zonatus) and an aji, horse-mackerel, (Caranx trachurus). 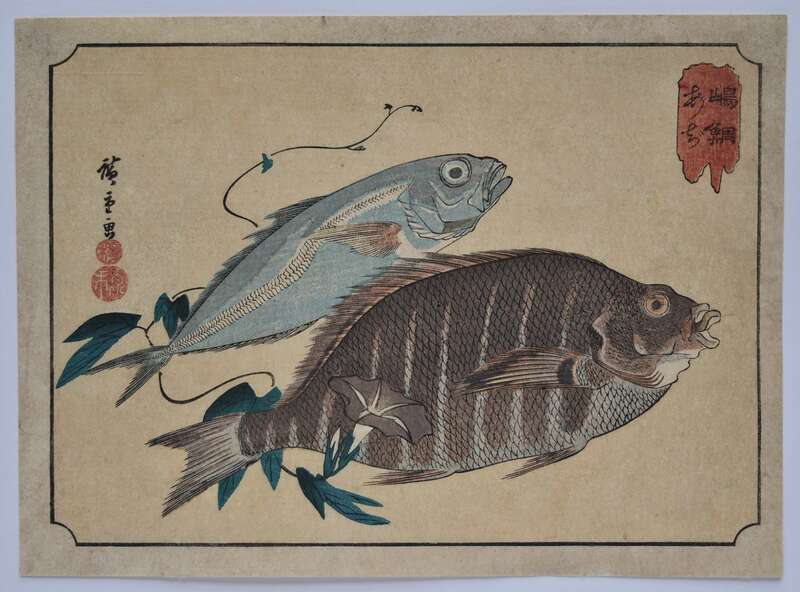 From a set of eight prints of various fish published c. late 1830s. Fine impression and colour. Slight soil, otherwise very good condition. 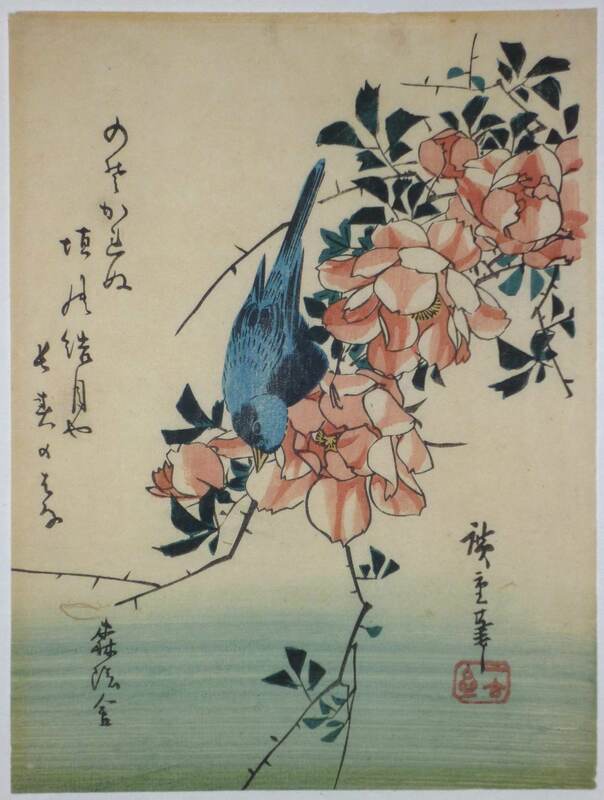 Signed Hiroshige ga.
A falcon and camellia. 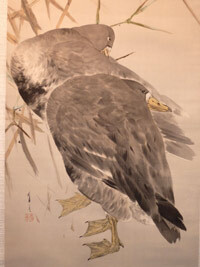 One design from the album: Kaihaku raikin zui, A Compendium of Pictures of Birds Imported from Overseas. The first edition published by Gungyokudo Matsumoto Zembei, 2/1789. Copies of the first two editions are excessively rare and it was then reissued with the plates signed Keisai (as here). However this print does not appear to be from an album and judging from the quality of printing must be from the first printing with signature and when some prints were issued separately. Designs that appear on the market from this publication are invariably on thin paper and poor impressions. Fine impression with beautiful gradation and blind printing. On thick deluxe hosho Fine colour. Very minor soil, otherwise fine condition. Signed Keisai Utsusu. 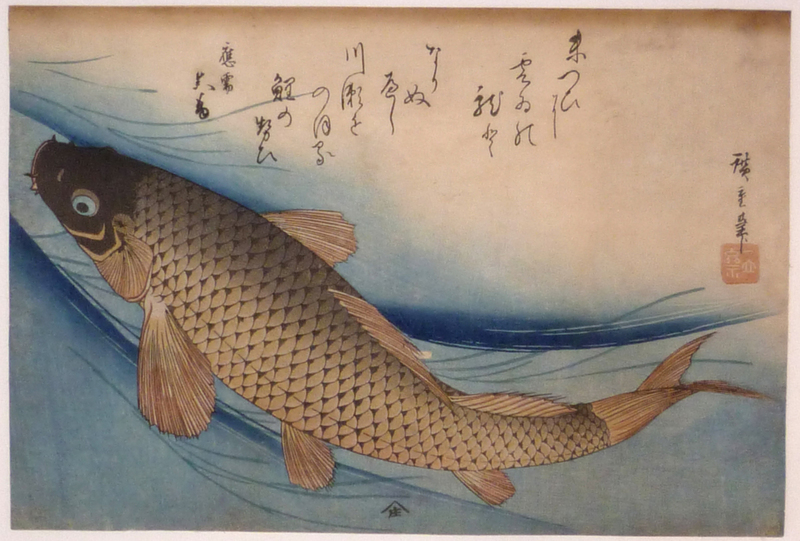 Koi, carp (Cyprinus carpio) from the second series of ten fish prints published by Yamasho, c 1840-42. The first series was issued privately for a poetry group ( probably the Shingyoku Circle ) with judges’ names and extra poems. Poem above by Makuzu. These prints are of the utmost rarity as probably only enough for the Circle were printed and they never come onto the market. Due to their popularity this first series was published commercially and a second set was commissioned. The best design from the second set. Other examples: Vignier and Inada, Vol. VI, pl. LXIX, no. 265 and Tamba, no. 424. Very good impression. 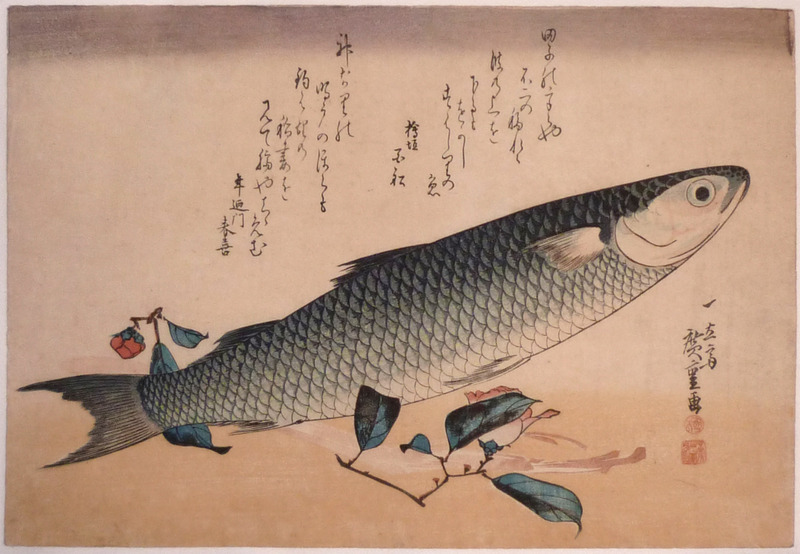 Early state: See Andon 49, Hiroshige: A shoal of red herrings, number 12. This is Kruml c with the b Ichiryusai seal. Fine colour. Slight trimming left and top, otherwise very good condition. Signed Hiroshige hitsu. 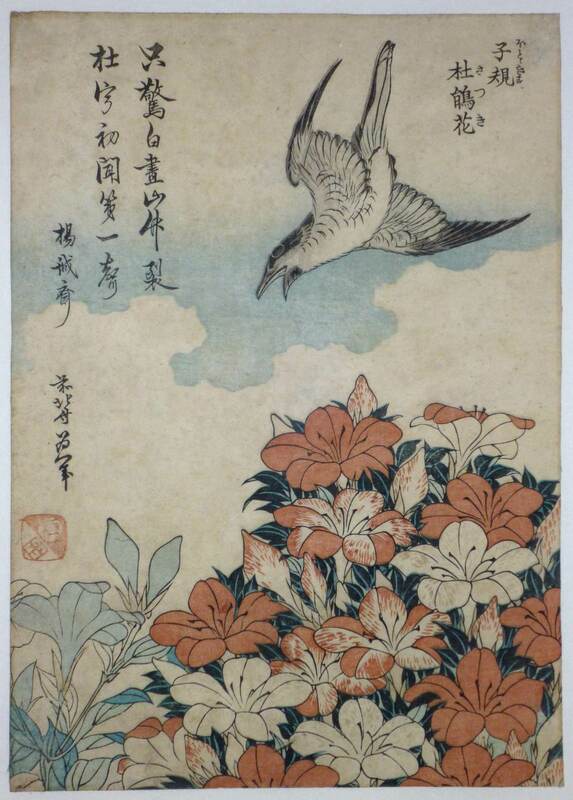 Cuckoo and azaleas from the so-called Small Flower series of ten chuban prints published c 1832. Amongst the most sought after of Hokusai’s prints. The first edition was published by and has the seal Eijudo. A later edition (as here) has combined manji and kiwame seal ( and some are printed on thin Chinese-style paper ), and there are also impressions extant without any seals which probably constitute a third state. All impressions are rare and the first state excessively so. Indeed, these prints are considered even rarer than the larger bird and flower set Hokusai designed c 1833. The printing and colour on this set comes close to surimono quality. Each print has a Chinese poem written in hiragana. Fine impression. Slight fading, otherwise very good condition. Signed Zen Hokusai Iitsu hitsu. Tobiuo, flying fish (probably Prognichthys) and ishimochi also called guchi or shiroguchi, white croaker, (probably Argyrosomus argenatus). Together with a single lily. Poem by Toshigaki Maharu. 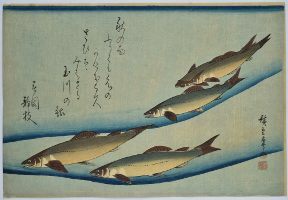 From the second series of ten fish prints published by Yamasho, c1840-42.The first series was issued privately for a poetry group ( probably the Shingyoku Circle ) with judges’ names and extra poems. These prints are of the utmost rarity as probably only enough for the Circle were printed and they never come onto the market. Due to their popularity this first series was published commercially and a second set was commissioned. Fine, early impression with mica on the flying fish. Fine colour and condition. Full size and no centre fold. Signed Hiroshige ga in blue (which I have never seen). 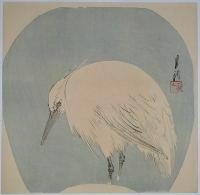 An uncut fan print showing a great white egret. Rare. Fine impression, colour and condition. Signed Gekko. Shrike and wild strawberry from the so-called Small Flower series of ten chuban prints published c 1832. 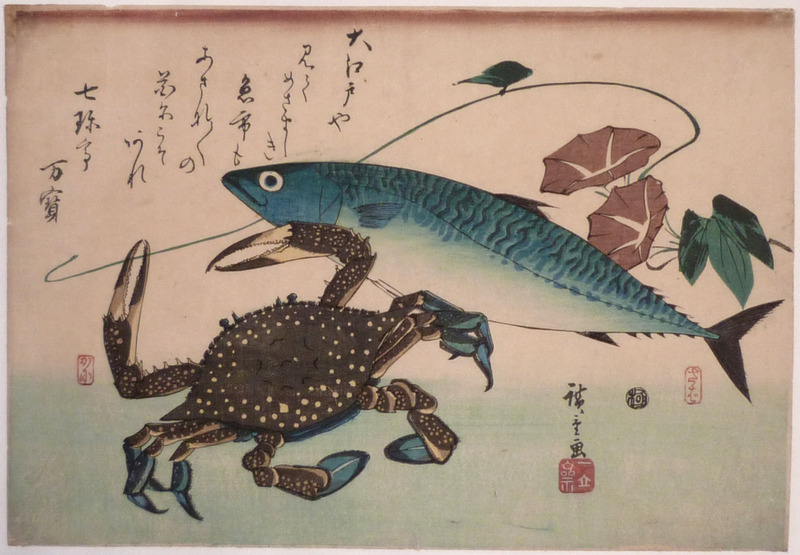 Amongst the most sought- after of Hokusai’s prints. The first edition ( as here ) was published by and has the seal Eijudo. A later edition has combined manji and kiwame seal ( and some are printed on thin Chinese-style paper ), and there are also impressions extant without any seals which probably constitute a third state. All impressions are rare and the first state excessively so. 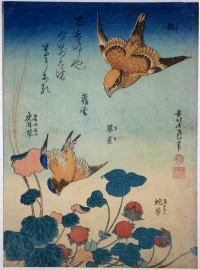 Indeed, these prints are considered even rarer than the larger bird and flower set Hokusai designed c 1833. The printing and colour on this set comes close to surimono quality. Each print has a Chinese poem written in hiragana. Fine impression and colour. Minor soil, otherwise very good condition. Signed Zen Hokusai Iitsu hitsu. A prolific pupil of Eizan. Shows a carp swimming among water-weed. Blue ground. An extremely rare print. Published by Ezakiya, c 1843-6. There is another version of this print without censor’s seal and with a moon reflected in the water. This appears to be a copy of the impression offered here as the blocks vary slightly. Ex Vever collection, Sothebys 1977, Part III, lot 227, p. 120 ( who also sold the copy, lot 228 ). Fine impression, colour and condition. Signed Keisai. A vertical diptych of a carp leaping a waterfall. Published by Kansendo, c 1830 – 44. Illustrated Keisai Eisen: Artist of the Floating World, Chiba City Museum of Art, 2012, p. 240, pl. 313. Very good impression, colour and condition. This was a popular design and later impressions are common. Signed Keisai hitsu with large red artist’s seal Eisen. Fine impression, colour and condition. 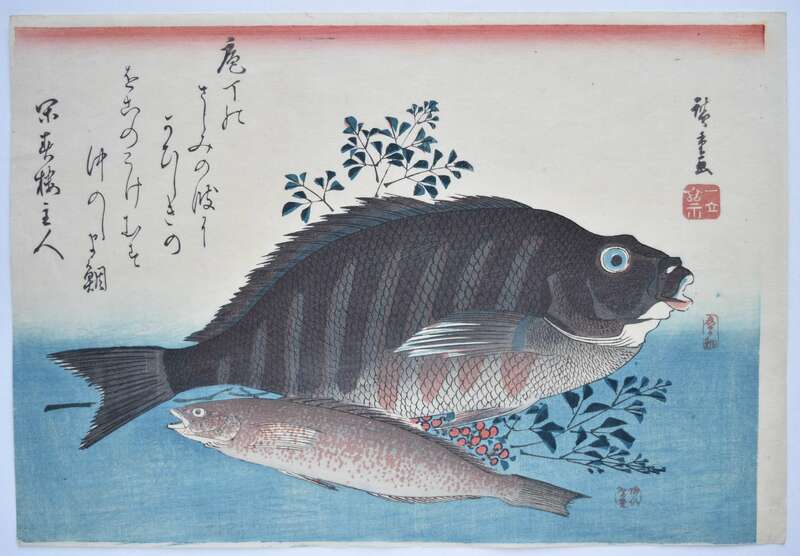 Signed Ichiyusai Hiroshige ga.
Kurodai, black sea bream ( Acantho pagus schlegeli ) and akadai, red bream ( Pagus tumifrons ) together with bamboo shoots and Japanese pepper. Poems by Tomigaki Uchiyasu and Kaoan Hoshi.. From the first series of ten plus one prints published by Eijudo c. 1832-34. The set was issued privately for a poetry group ( probably the Shingyoku Circle ) with judges’ names and extra poems. These prints are of the utmost rarity as probably only enough for the Circle were printed and they never come onto the market. Fine, early impression before the grey block defect on the tail of the black sea bream. Full size. Kruml 10b. Signed Ichiyusai Hiroshige. 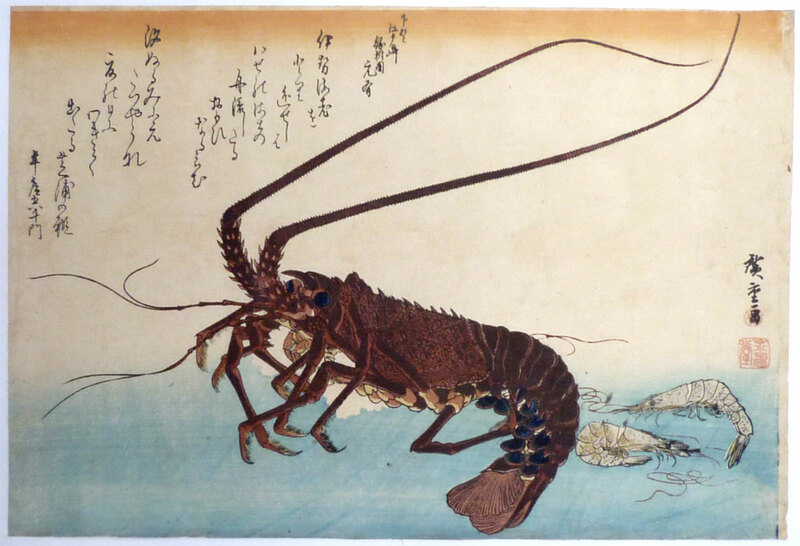 Ise-ebi, spiny lobster or crawfish ( family Panulirus ) and shiba-ebi, shrimps. Poems by Ryokujuen Motoari and Toshihiro Machikado. From the first series of ten plus one prints published by Eijudo c. 1832-34. The set was issued privately for a poetry group ( probably the Shingyoku Circle ) with judges’ names and extra poems. These prints are of the utmost rarity as probably only enough for the Circle were printed and they never come onto the market. Very good impression and colour. Full size. Kruml 4c. 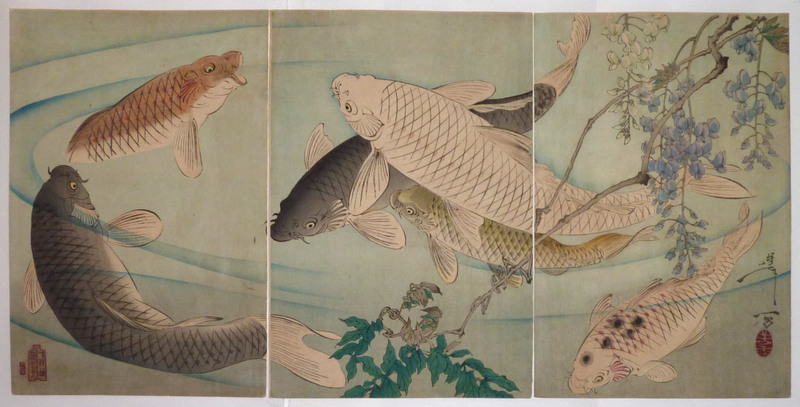 Signed Hiroshige ga.
A triptych showing koi, “carp” swimming beneath hanging wisteria. One of Yoshitoshi’s finest and most popular designs. Published by Akiyama Buemon, 5/1889. See Beauty and Violence, Society for Japanese Arts, 1992, no. 66, p. 144 for another impression plus the original drawing by Yoshitoshi ( from the British Museum ). 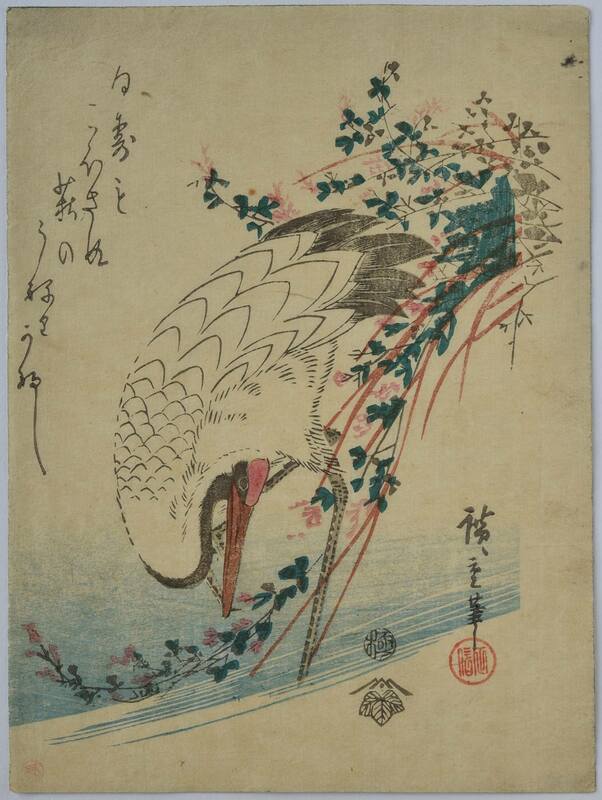 Also see this website in Brush Drawings and Hanshita-e for another two original drawings of koi by Yoshitoshi, possibly preliminary working ideas for the British Museum drawing. Yoshitoshi only produced one other carp print, a large surimono. Common carp were first bred for colour in Japan in the 1820s. Their name is a homophone for another word meaning “love” or “fidelity” and they are symbols of love and friendship in Japan. Very fine impression and colour. Slight oxidation although not as much as is usually found on this design. Slight signs of mounting au verso, otherwise very good condition. Koi, carp ( Cyprinus carpio ), swimming amongst reeds. Poem by Makuzu. 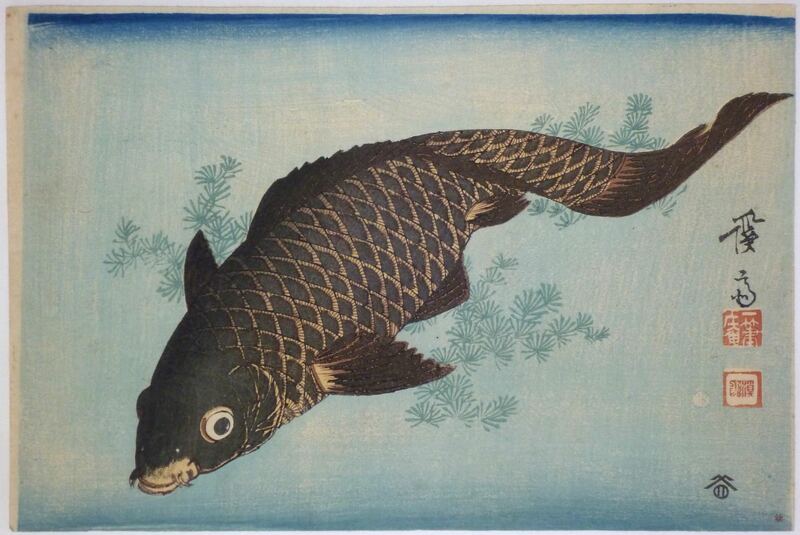 From the second series of ten fish prints published by Yamasho, c 1840-42. The first series was issued privately for a poetry group ( probably the Shingyoku Cicle ) with judges’ names and extra poems. These prints are of the utmost rarity as probably only enough for the Cirle were made and they never come onto the market. Due to their popularity this second set was commissioned.This is the very rare first edition with the reeds printed. Block defect showing but with gradation still on belly. One of the finest designs from the two series. Very rare. Kruml 12a/b. Fine impression. Very slight fading and thinning, oltherwise very good condition. Full size and without centre fold ( in itself rare as they invariably have them ). Signed Hiroshige hitsu. Bora, the grey mullet ( Mugil cephalus ). Together with camellia and Japanese asparagusudo. Poems by Higaki Kunifune and Toshinoto Haruki. 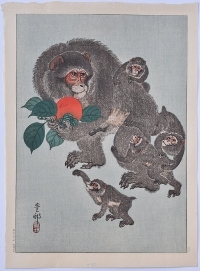 From the first series of ten plus one prints published by Eijudo c 1832-34. The set was issued privately for a poetry group ( probably the Shingyoku Cicle ) with judges’ names and extra poems. These prints are of the utmost rarity as probably only enough for the Cirle were made and they never come onto the market. This is the very rare first edition with gradation on the asparagus and mica on the mullet. Kruml 9b. Fine impression, colour and condition. Full size and without centre fold ( in itself rare as they invariably have them ). 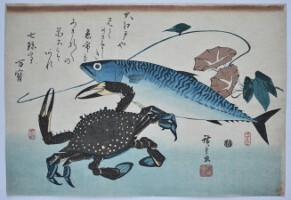 Signed Ichiryusai Hiroshige ga.
Kani, crab, Charybois and saba, mackerel ( Scomber Japonicus ) together with morning glory. Poem by Shichichintei Mampo. 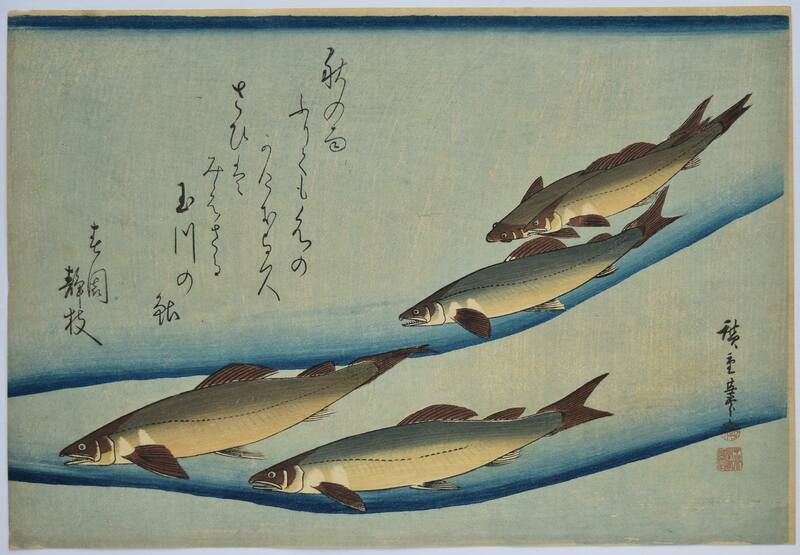 From the second series of ten fish prints published by Yamasho, c1840-42.The first series was issued privately for a poetry group ( probably the Shingyoku Cicle ) with judges’ names and extra poems. These prints are of the utmost rarity as probably only enough for the Cirle were made and they never come onto the market. Due to their popularity this second set was commissioned.This is the very rare first edition with Ichiryusai seal printed over the ground colour and the names of the crab and mackerel crisp. Kruml 19a. Very fine impression and colour. Slight soil top left corner, otherwise very good condition. Full size and without centre fold ( in itself rare as they invariably have them ). 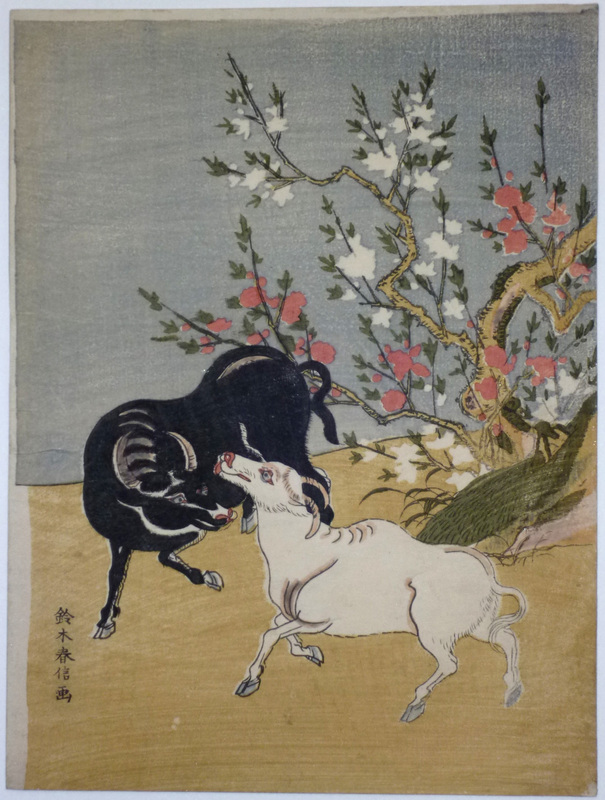 Signed Hiroshige ga.
A chuban print of a pair of oxen. One of the Junishi, Twelve Zodiacal Signs ( this being Ushi ). Complemented here by a red and white plum tree. People born in the Year of the Ox are known to be difficult but, once committed, they are loyal for life. And the plum tree symbolizes conjugal loyalty. Exceptionally rare: One other impression is illustrated in Yoshida, Harunobu zenshu, p. 112. Indeed, Harunobu designed very few kachoga, unlike Koryusai who made many a few years later. This could have been intended as one of a set of twelve prints, but the likelihood is that it is a single design. Published c 1767. Fine impression with the outlines of the oxen heavily gauffraged. Exceptional condition: The background blue is from the dayflower ( Commelina communis L. ). One of the most fugitive pigments, here completely intact. The petals were collected at dawn, squeezed, and applied to paper which was used as a carrier. Very fine colour and condition. Signed Suzuki Harunobu ga.